Accuracy is a key attribute of any good golfer’s game. However, at Deer Creek Golf Course in Overland Park, KS, accuracy is a must. The picturesque course was designed by renowned architect Robert Trent Jones, Jr. who utilized the heavily wooded land and wandering creek to create a masterpiece. The layout has always been described as exceptional, but the true allure of the course is that it doesn’t rely on length to provide challenge. The course stretches to a modest 6811 yards from the tips and can play as short as 5126 yards, offering every golfer an option to find the right distance. But don’t naturally think that a shorter distance makes the course more playable. Some longer hitters may find the second or third tee boxes more challenging than the furthest back tees. With strategically placed landing zones and frequent use of dog legs or the creek, most golfers would do well to match their length to the right tee box. That shape is due, in part, to re-built greens, a project that began two years ago and was completed in time for some late season golf. The project continued with a complete overhaul of many of the course’s sand bunkers to improve drainage and provide for more consistent play. 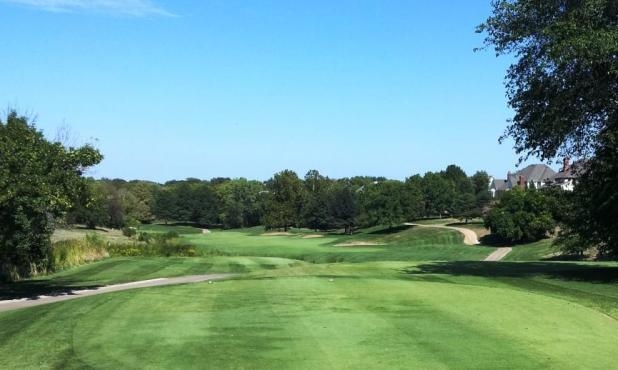 Players heading to Deer Creek are greeted with an opening hole that features a sharp dog leg left. Accuracy is at a premium right from the start with a pair of bunkers on the inside corner of the fairway’s bend. A well-placed shot finds a generous landing area that sets a golfer up well for a challenging shot to an elevated green guarded by more bunkers. From there, the course plays like the ultimate shotmaker’s test. A number of the par-4s call for a club other than a driver, and all holes require a strategy to place the ball in the most likely spot to avoid trouble and set up the next shot. In this regard, Deer Creek is a golf course that should be played frequently. Like other classic designs, it is one that gets more intriguing, and more interesting, the more it is played. The course continues to throw challenges at golfers by greeting them with the number 1 handicap hole at the third. The par-4 starts from an elevated tee box with a brush-lined creek on the right and bunkers left. After successfully navigating all that, golfers are faced with a tight shot to a narrow green fronted by water. Accuracy. The fifth hole is another par-4 requiring, of course, accuracy off the tee. The typical play is a long iron or hybrid off the tee to a tight landing area in order to set up a second shot to an elevated green on the other side of the ever-present creek. A tee shot that wanders left will find a heavily wooded hillside and those that leak to the right will likely find trees lining the fairway prohibiting a clean view and an open shot to the green. The seventh is where most golfers can see the brilliance of the designer. From the tee, the fairway looks wide open, but the trees and out of bounds on the left side of the soft dog leg right often swallow up drives that aren’t hit on the correct line. Again, drives that drift right will bound down a slope and get buried in evergreens. But, find the center of the fairway and a tee shot can land on a sharp down slope, kicking it forward another 30 or 40 yards and setting up a great birdie opportunity. 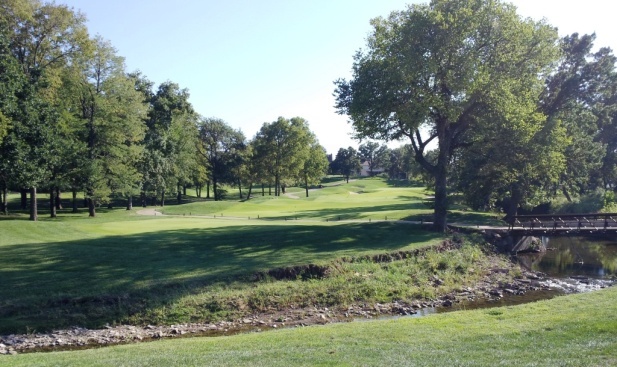 The back nine starts out on what is perhaps Overland Park’s best known golf hole. Even non-golfers are familiar with the par-4 that runs along Metcalf Avenue, complete with a net that protects traffic from snap hooks. 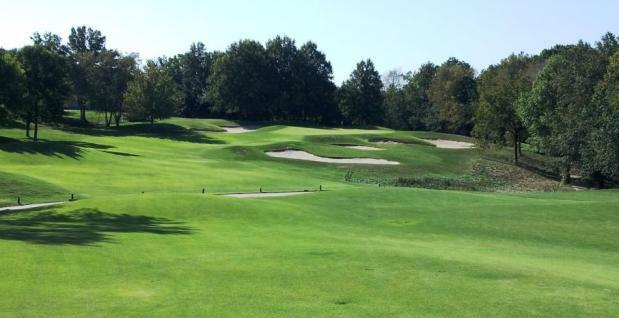 On another hole with no bailout, most golfers would choose their club from the teebox wisely to land in the widest landing area before the creek narrows the fairway in front of the sharply two-tiered green. The back nine continues in a similar fashion with unique holes demanding accuracy and well thought strategies. The fifteenth is a long, challenging par-3 requiring a tee shot to carry the creek again in order to safely find an elevated green. That’s not the last shot requiring accuracy though. The seventeenth is a short par-4, but the creek crosses the fairway at a distance that results in most drives finding a watery grave. Rather, most golfers would again do well to choose a long iron or fairway wood to hit the widest and safest section of fairway. A round of golf at Deer Creek ends with a par-5 that, as expected, features the creek crossing the fairway, requiring one of the many scenic bridges to cross before striking (or, maybe even putting) a third shot. From there, it’s on to the clubhouse which is a great place to wrap up a round of golf. But the quality of the venue makes it more than that – it’s also an ideal location for a business meeting over breakfast or lunch, followed by a round of golf in the afternoon. Jeff Miller shared that many groups do just that. “After the meeting’s over, they get out and play some golf together. It adds to the experience. We have everything ready for them. So if you’re a golfer, and a business person, what a perfect day,” he said. With two large banquet rooms, each holding over 225 guests, the Deer Creek clubhouse also makes a great place for weddings and parties. The course is ready to challenge you today, so come out and your accuracy to the test. You won’t go away unfulfilled. 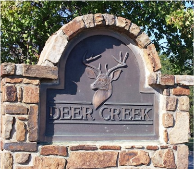 For more information, visit their website at www.deercreekgc.com, or give them a call at (913) 681-3100. As hybrid clubs continue to get easier to hit, provide more distance, and launch the ball higher, there are a couple of important things to look for when you need a club to replace a long iron or fill a distance gap between your fairway woods and irons. The first is obviously how far you hit the club. But don’t be fooled by anything labeled a 2, 3, or 4 hybrid. Often, those markings merely indicate that the club has similar loft to a 2-, 3-, or 4-iron. Based on the springlike effect of a hybrid with a hollow cavity and other design features, a hybrid of the same loft will often launch the ball higher and send it farther than a traditional iron. As one example, I carry an iron set that runs from pitching wedge through a 4-iron and then have a 4-hybrid and a 3-hybrid. Those two hybrids send the ball almost the same distance as a well struck shot with my old 3-iron and 2-iron, respectively, while being a whole lot easier to hit. The second consideration is the clubhead size and shape. Clubs labeled hybrids range today from smallish-looking fairway woods to fattened driving irons. The shape and size you want depends on what your game needs. If you are looking for maximum forgiveness and distance, you should favor the larger head sizes. If you prefer more workability and performance from the rough, you should look to the smaller headed, more iron-like hybrids. Whichever loft and style you prefer, there are some new hybrids on the market today to match you need. Some of the newest features are the addition of technologies previously only seen in drivers and fairway woods, like adjustable hosels, use of multiple materials to maximize forgiveness and ball speed off the face, and lightweight construction. Read on for some of our favorites. Adams’ Idea Tech V4 is their newest hybrid – or at least it will be when it hits retail stores in October. It incorporates their new Third Generation Velocity Slot Technology. The Velocity Slot is something used before in other clubs, but the new version provides even more springlike effect via a “Through Slot” that goes completely through the club. That design provides even more face flex to increase ball speed. In fact, the trampoline effect is close to USGA standards, bringing as much distance as possible into these clubs. Adams claims up to 15 more yards compared to standard hybrids that don’t incorporate slots. What that means is that you can launch balls higher and farther with a softer landing than your current hybrid. Another model, the Adams Idea Super XTD Hybrid, has been on the market for a while now and is very advanced, with technologies typically seen in drivers. By that, we mean it has a stainless steel sole with a titanium face and crown. Such use of materials lowers the center of gravity to launch the ball high and send it a long way, even on thin shots. The J40 Hybrid from Bridgestone combines materials as well with a tungsten heel weight attached to a stainless steel clubhead. The crown of the club has been manufactured to be as thin as possible. This popular design feature means a lower center of gravity which, as described in theAdams club, provides for a higher ball flight and more forgiveness by placing more weight along the sole and the heel and toe areas. The tungsten weight in the heel will help golfers release the clubhead and close the face through impact to promote a straight ball flight. The Callaway RAZR X Hybrid incorporates a lot of new technology, some of it advancements of prior technology, not unlike others in this category of clubs. For starters, the club has what they call Aggressive VFT face design. VFT is Variable Face Thickness, something seen on Callaway clubs for some time that amounts to manufacturing a club face that is strategically thin through the center to provide more ball speed and expand the sweet spot. The club also has a zero roll face, meaning there is less curvature in the face. That is something they say provides for a higher launch on all shots, but especially helps out on thin contact with the ball. 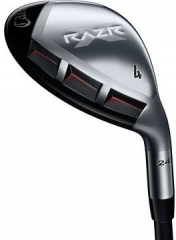 Their RAZR X Tour model is similar but with less offset and other features that better players will appreciate. Meanwhile, the RAZR X HL version has a larger head than the RAZR X to provide a larger hitting area and even more forgiveness. 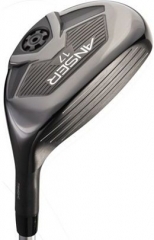 Ping’s new Anser Hybrid has improved head shaping and other features that should appeal to all golfers. The first noticeable item is the matte black, non-glare finish. A careful look will reveal a wider clubface with more width along the sole than mostPing hybrids to help with contact, particularly thin contact that many golfers put on the ball. Ping maintained a traditional look at address for their stainless steel club while providing a progressive placement of the center of gravity throughout each loft. It is lower and farther back in the less lofted hybrids to improve forgiveness – something we all need in our longer clubs. The TaylorMade RocketBallz Rescue (for some reason they cling to the term “rescue” in lieu of hybrid) is everything you would expect of a club named “RocketBallz.” It has a lightweight shaft and grip – features they have incorporated in drivers and fairway woods for years to help increase golfer’s swing speed. The trademark white crown and black face assist with alignment while a new design feature seems reminiscent of something seen for a couple of years now in other manufacturer’s clubs. The “Speed Pocket” is a groove or cavity that runs along the sole of the club just behind the face. Apparently this design feature works as more and more seem to be using it to boost distance. A couple other models, the RocketBallz Tour TP Rescue and the RocketBallz Tour Rescue are very similarly designed with only a few differences. The lofts tend to run stronger and other features provide for a more penetrating ball flight. Titleist’s 910H is one of the few hybrids on the market that incorporates adjustability into its design. With the SureFit hosel, golfers can tweak the loft and lie through 16 different settings. The 910H has a slightly larger head that has been re-designed to provide for a higher launch and more control. However, it’s the SureFit hosel that provides the most interest, allowing adjustments to hit the ball higher or lower an promote a fade or draw, as needed. Whatever you choose, realize that a lot of hybrids are being designed for more and more ball speed, which translates into distance. In some cases, that may not always be a good thing if you don’t want a hybrid that flies about as far as a fairway wood you already have in your bag. The best thing to do is hit some practice shots alongside the clubs you are trying to fit within. Take your 4-iron and 5-wood, for example, and make sure your new hybrid sends the ball an appropriate distance that lands somewhere in between. That way you can correct for the types of balls at the range, weather conditions, etc. that might lead to different distances than you would find on the course. 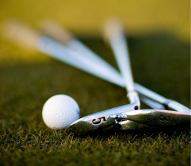 And, think about the shape and clubhead too – find one that works for your game and you’ll enjoy it much more.